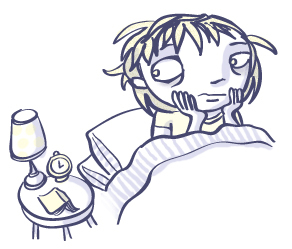 I had a vivid dream-filled night last night, which pretty much prevented me from getting ANY decent sleep. The first dream was extremely frightening. I don’t recall exactly what happened, but I woke up with a gasp, and sat straight up in bed. I was sweating, and it was only 12:30. I’d only been asleep for a little over 90 minutes. Lamesauce. The next dream was long. It involved Johnny Knoxville, Anthony Bourdain, a ghetto cruiser, and me not having my passport at the airport with only 15 minutes before our flight to Mexico took off. Johnny and Mr Bourdain were in charge of driving me home as fast as they could to get my passport, but they took a turn and tried to off-road with the ghetto cruiser (don’t ask me what the hell is going on). Needless to say, I get back to the airport with my passport, hand it over, and the gate person says it’s not mine. And sure enough, it was one of my best friend’s EXPIRED passport instead. To sum it up, it was your average anxiety dream. I usually get them a few weeks before a big trip. FOUR weeks ahead of the trip is a little much. Anyway, this dream caused me to wake up absolutely SOAKED with sweat. My shirt and pillow were pretty much damp and gross. I changed t-shirts and went back to bed. It was 4:30. I woke up again at 6am, just randomly…then the alarm went off 30 minutes later. Flop. I’m so tired. Today, my only task at work is to write my self-appraisal for my annual review. And it’s the most DIFFICULT THING EVER. I mean, writing about myself is no problem, but tooting my horn is a little more difficult when I have to recall everything I’ve accomplished at work for a whole effing year.